If you like Kermit the Frog, you will surely love Prescot. 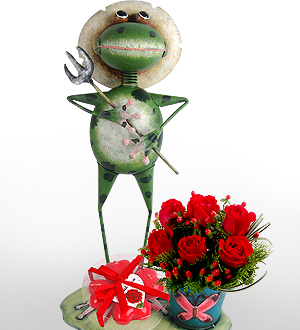 He is the unique garden frog metal sculpture that will captivate visitors' attention when placed in the garden. Comes with a bevy of red roses (12 stalks) and a set of heart candles, Prescot will definite steal your sweet heart's heart in no time. For delivery out of Klang Valley, fresh flowers will be replaced with artificial flowers or non-flower gifts. Kindly provide at least 3 days notice for outstation delivery.